Jitsvinger is concerned with matters of identity. Language. Land. Becoming. Being. He delves deep into the “who are you” and “why”. 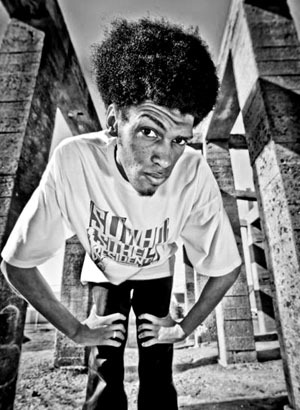 Through his lyrical, rhythmic fast-paces rhymes, he aims to do more that entertain. He enlightens. It’s a fine line to tread though. The tenuous balance of making history while attempting to preserve it. “I recognise that while I’m exploring and discovering, digging the facts and tracing roots; what I say and do becomes part of the puzzle as well.” Historians make history. Storytellers become the stories. People who dare to tell their own truth, in a personalised manner, become truth. He brings the same passion for preservation into how he makes his music. Discovering Hip Hop in the early 90’s, he found through it an escape. A raw honesty previously unheard of, unwitnessed. “The metaphysical properties of Hip Hop, the metaphors, helped me imagine a better world,” he muses. “I’d get tapes from my brothers and cousins, lock myself up in my room and see what they were rapping about right outside my window. I thought to myself ‘let me try’”. You see was always there. Jits comes from a huge musical family. Grandparents, uncles and aunts; all musicians in their own right. “They were a music institution and they didn’t even know it,” he exclaims. “My mom taught me how to play the guitar!” Nothing street-hard about that, but nothing easy either. He was still stuck in the factories. Laced up in boots and blue overalls, brewing a plan. “When I was working in the factories, I would look around and see old men who had been there their whole lives. Who were content, or rather they thought they were content. I’d be labelling boxes, or preparing packages with Busta or The Last Emperor, or Wu Tang in my head. I used to think ‘This is not my life. I didn’t make this decision. This is not my lot to carry.’ Rhyming was the escape hatch at the back of my head.” So he kicked down that door, and found his freedom. “I don’t conform to being coloured or black,” he elaborates. Category: Articles | Tags: Jitsvinger, Lindokuhle Nkosi, Pan-African Space Station, PASS | Bookmark: permalink.